I just love sharing such fun announcements with you all!! I announced it on the blog's Facebook page but not here yet and not everyone has Facebook so I thought I'd announce it here as well! After talking about doing it for so long now, my husband and I finally opened up our very own Etsy shop!! There is not a lot listed at the moment but keep checking back because I'll be adding more items as time goes on! We've got lovely little button bracelets and embroidery floss earrings as well as a few other things on there now. If you see a style you like but in the wrong color (or vice versa) then please let me know! I am more than happy to provide custom items! I even crochet the most adorable little plush monster toys for children! My niece absolutely loves them! Like I said before, keep an eye out because more will be added! I'll be adding listings for crocheted hats, scarves, cosmetic bags and custom pencil art by my husband. And who knows what else! I'm up for anything! I'll probably start making reusable dryer sheets again soon and try to sell those as well. What do you think? 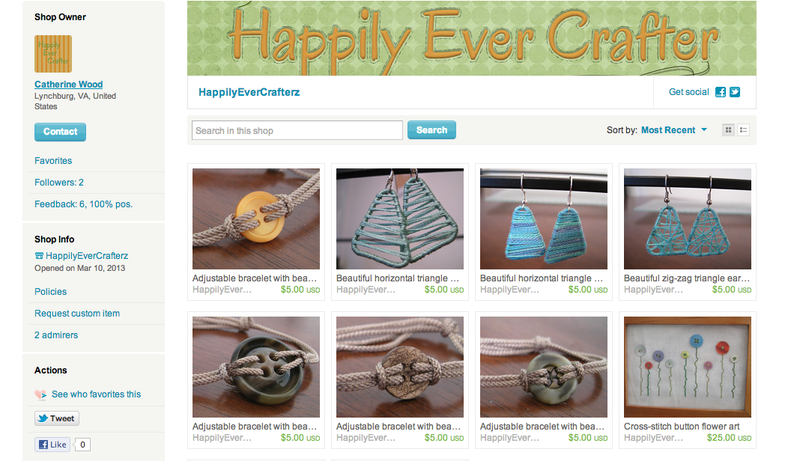 If you have an account on Etsy, be sure to click the little red heart to "favorite" my shop! Oh and don't mind the "z" at the end of Happily Ever Crafter. I didn't have a choice, Happily Ever Crafter is taken as a shop name even though the shop has not been active in a very long time! Unfortunate but that's ok.
What types of things would you like to see being sold in my Etsy shop?